Every September, thousands of patrons donning dirndls and lederhosen will enter the coveted beer tents of Oktoberfest Munchin. While a trip to Munich for the 16 day Wiesn is bucket-list worthy, there are hundreds of Oktoberfest celebrations in the U.S. that offer great beer, food, music, and entertainment. Oktoberfest is known as a unique celebration to mark the beginning of autumn and harvest season, including competitive events. Here are some featured Oktoberfest activities and contests to inspire your fest season, because sitting and drinking beer is so two centuries ago. Brothers Nick and Drew Lachey do, cherish brews at Oktoberfest-Zinzinnati. Masskrugstemmen is a common Oktoberfest competition requiring both strength and stamina. Resisting the urge to drink the beer is nearly as challenging as holding the full liter for an extended period of time. The stein may not fall below 90 degrees. Clearly, the guys from 98 Degrees have an advantage. The objective: Hammer a nail into a stump. Each participant gets one attempt at a time until the winner nails it. These participants at Oktoberfest Northwest have drawn quite a crowd! Germans have a different way of giving each other the middle finger. Using the competition table for leverage, contestants wrap a leather loop around the middle finger and aggressively pull the opposing person's arm across the middle of the table. YouTube it. 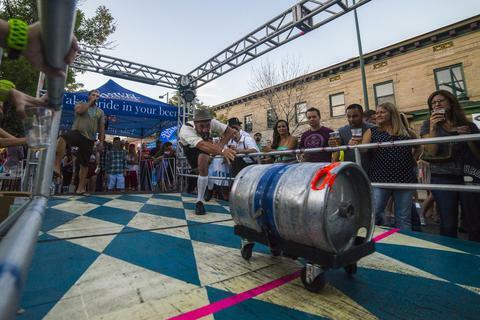 While there are multiple versions of a keg bowling contest, Denver Oktoberfest lays claim to the national keg bowling championships. Contrary to (pop-ular? ha.) belief this is not an alternative method to putting bubbles in beer, the kegs are empty! Oktoberfest can be a sausage fest of sorts, and one major way is via brat eating contests. The Big Weiners of this competition have golden stomachs. San Diego’s Ocean Beach Oktoberfest also hosts a Sausage Toss Competition. Qualification rounds involve tossing a sausage into a tub. The following day 10 finalists participate in a secret, high stakes competition which is unveiled at the fest. The winner lands a $10,000 cash prize! 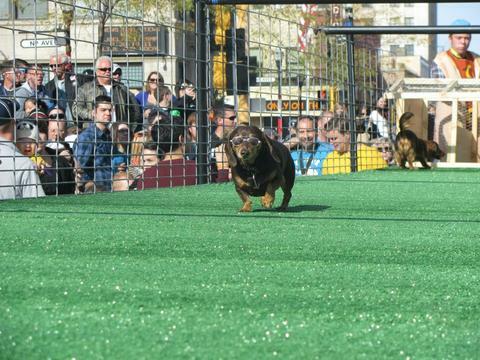 We fully support the increasing popularity of weiner dog racing at Oktoberfest. Dachsunds are of German descent and related to sausage by form and nickname--What could be more authentic than getting them involved in an Oktoberfest game? Dachsund translated into English literally means "badger dog," and this badger dog don’t care, he just won Running of the Wieners at Fargo Oktoberfest. At Oktoberfest NOLA, competitors are separated into Puppy, Wheelie, Adult and Senior divisions. Dachsunds don't get to have all the fun, however. Canines of any breed can compete in Addison's agility competiton. The DAWG Pretzel Run Agility Course includes a giant 80-foot pretzel tunnel! Carrying an empty stein (or eight) is a challenge with each one weighing in at nearly 3 pounds. This impressive challenger is up for the task in the Strongest Barmaid Relay at Soulard Oktoberfest. Similarly, contestants in the Krug Carry at Linde Oktoberfest Tulsa carefully tote up to 35 pounds of beer across a relay course and are judged on time and spillage. Texas Chainsaw Massacre meets Oktoberfest. Totally logical. Well, Oktoberfest is a seasonal celebration and pumpkins are an autumn icon...so maybe it's not so random. This contestant is making a killer pumpkin spray at Fremont Oktoberfest. Singing, dancing, and traditional music are a part of any great Oktoberfest. The tuba plays an important role as the background music to a great time. You may recognize its sound. The Fredericksburg, TX Oktoberfest hosts an annual OkTubaFest as part of their celebration, allowing anyone who plays tuba or euphonium to showcase their skills. We'd love to see this tradition paired with Addison's German Idol Yodeling Competition (or perhaps the German Spelling Bee). More than one Oktoberfest claims to hold the World's Largest Chicken Dance. Regardless of whether you're in Cincinnati, Tulsa, or elsewhere, chicken dancing is a family friendly, fun activity to get in the Oktoberfest spirit. Oktoberfest Zinzinnati has the undisputed largest kazoo band, which seems like a natural pairing with chicken dancing. There are ice luges you sled down and ice luges you pour Jägermeister down. This one is neither of those things, yet is also both of those things. 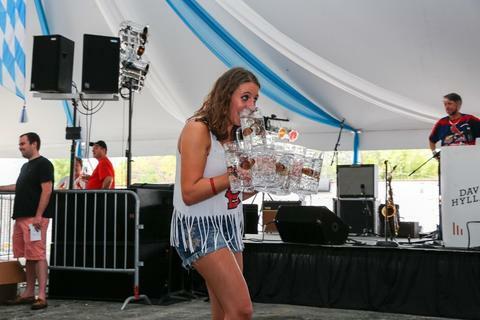 It's the Summer Luge at Muskegon Oktoberfest, and because weight is an advantage, it is best done after consumption of delicious brats (at your own risk). Leather pants aren't the typical golfer's attire, but when affiliated with Oktoberfest, it's only natural. These fest goers at Mount Angel Oktoberfest take a break from sausage to hit the links. Vor! Best done prior to beer drinking and without cumbersome leather britches, tricycle racing is an up and coming Oktoberfest challenge. The smaller to the tricycle, the better. Participants at Bend Oktoberfest are suited up for the challenge! What? Kubb, (pronounced ‘koob’), or "Viking Chess" is a nordic lawn game that involves tossing wooden batons at Kubbs to knock them over. The objective is to be the first to knock down the King in the middle, which goes down last like the 8 ball. Read the official U.S. National Kubb Championship rules here. 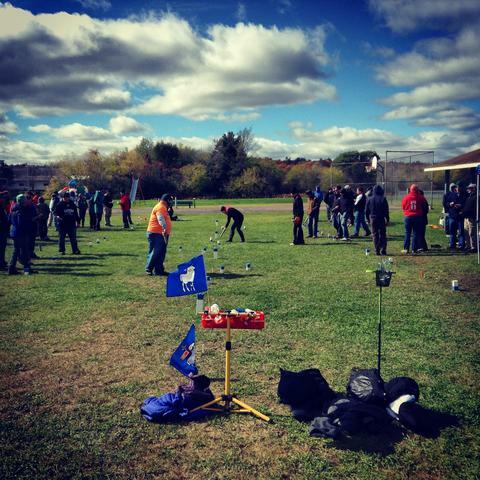 Wisconsin Kubb hosts an annual tournament at Valkyrie Brewery's Oktoberfest in Dallas, WI. An appropriate tournament cheer might be 'Nice Kubbs!' Meanwhile, the sausage experts at Louie's Finer Meats will be grilling the ‘colossal brat.’ Last year’s creation (below) was 165 feet long! To get locals excited for Oktoberfest in La Crosse, WI, the great medallion hunt is staged before the fest begins. A clue is posted on the Oktoberfest USA website every morning at 6am leading up to the fest. The site makes it clear that the medallion is never buried in the ground or on private property, so picks, shovels, and metal detectors are not required. The prize? $500 and a miniature replica medallion to commemorate your enthusiasm. 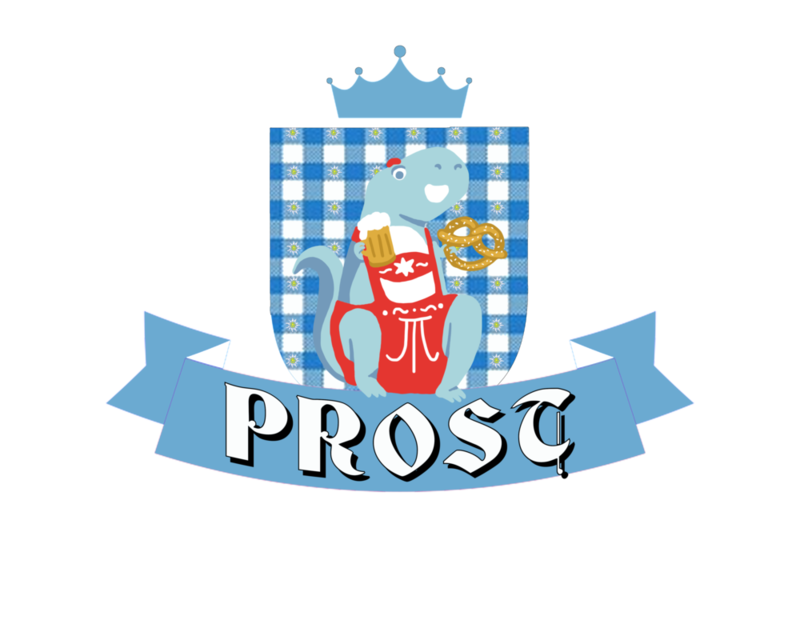 Stein holding, dirndl competitions, and in some cases general pageantry are part of Ms. Oktoberfest competitions across the US. We like the way they've incorporated a basic training vibe to Ms. Oktoberfest in Red River, NM. Eat your heart out, festers. That's right, after all of the sausage eating and beer drinking, the final step is to compare bellies. And this competition from Das Oktoberfest takes serious guts.